One result of small space living (or a small kitchen at least) is the true need for clever kitchen storage solutions. We’ve come up with a few that utilized stuff we already had, like an office document/mail organizer tucked in a lower cabinet to neatly store oversized Tupperware/lids & a larger, short, round Rubbermaid container to keep smaller lids tidy that we stuck to the inside of the door of the same lower cabinet with industrial Velcro. We’ve never had a great solution for storing herbs & spices that we use frequently. We bought these containers that we love, but had them stacked in a two-tiered “system” on our kitchen shelves. It wasn’t the best use of their great see-through lids & it still left us shuffling through spices whenever we wanted to use them. I’ve seen a lot of terrific spice storage solutions but wanted something that utilized our existing jars & a smallish wall space we have in our kitchen next to some cabinets. Note: the best placement for spice storage is somewhere darkish (or out of direct sunlight) and a coolish/room temp. While the magnetic tins we made would be fine stuck to the side of a refrigerator, the fridge in our kitchen can run a little warm & the side we’d have stuck them to is right next to the window, so we opted for a space on the other side of the kitchen, away from direct sunlight and appliances that emit heat. I intentionally made the labels take up a large part of the see-through lid – to keep out even more light. Spice rack stainless steel magnetic base: We used this and were really pleased with the quality & speedy shipping. Screws are not included so be prepared to provide your own for attaching the base to the wall. Tins: Source: Specialty Bottle — I’ve ordered lots of things from SB & they’re great! They’ll send you a couple of samples too (at no charge!). The possibilities are endless but as previously mentioned, we used these. Magnets: I bought these but you can also search for them on Amazon & elsewhere on the web. I’ve seen other tutorials that use magnetic paper. That would be fine too – but in my experience, it’s not as strong as individual magnets & I didn’t want to go to the trouble to make this whole thing, only to have the heavier spices slide down the wall mounted base. Glue: I used E6000 (that I bought at a local craft store). It worked well but it’s super toxic AND even with the windows open (hooray for a warm winter!) & a tabletop fan pointed towards the window….WOW — the smell was horrible & made me feel nauseous! I’d forgotten how toxic this stuff is…ick! 1) Measure the space you want to put your jars. Make sure if it’s near a cabinet, that the door when opened, will clear the jars on the wall. 2) Glue magnets to bottoms of jars. 3) Download my free printable spice jar labels & please ignore the little dashed line in the template — I can’t, for the life of me, get rid of it & it doesn’t appear in the original design file. It won’t appear on your finished labels because you’ll cut them out anyway! Print them on a big sheet of label paper (like this kind from Staples) & punch out. I used a 1.5 inch round craft punch. 4) Fill jars with spices/herbs & attach the tops. 5) Write on labels & stick to tops of jars. I love a handwritten label but if you don’t, you could use a label maker/vintage typewriter or add spice names to labels in a design program before printing. 6) ENJOY! If you have space at the bottom, use a magnetic clip to hold grocery lists and a tally of spices you’re running low on or out of. Use a cookie sheet (new or vintage) or have a home supply store cut you a sheet of stainless steel – just make sure it’s magnetic (not all stainless/metal is) and we didn’t go to a home supply store because I wanted rounded corners (pointy metal corners are SHARP!) – also I wasn’t sure I wanted to deal with drilling the holes in the metal for hanging. We’re comfy with DIY (& power tools!) but I really didn’t want to overcomplicate things for this project. If you’re in the mood for a visit to Ikea, this would be an awesome option (it’s nice & tall & comes in white, too). I like the jars a lot & the finished product reminds me of honeycomb. 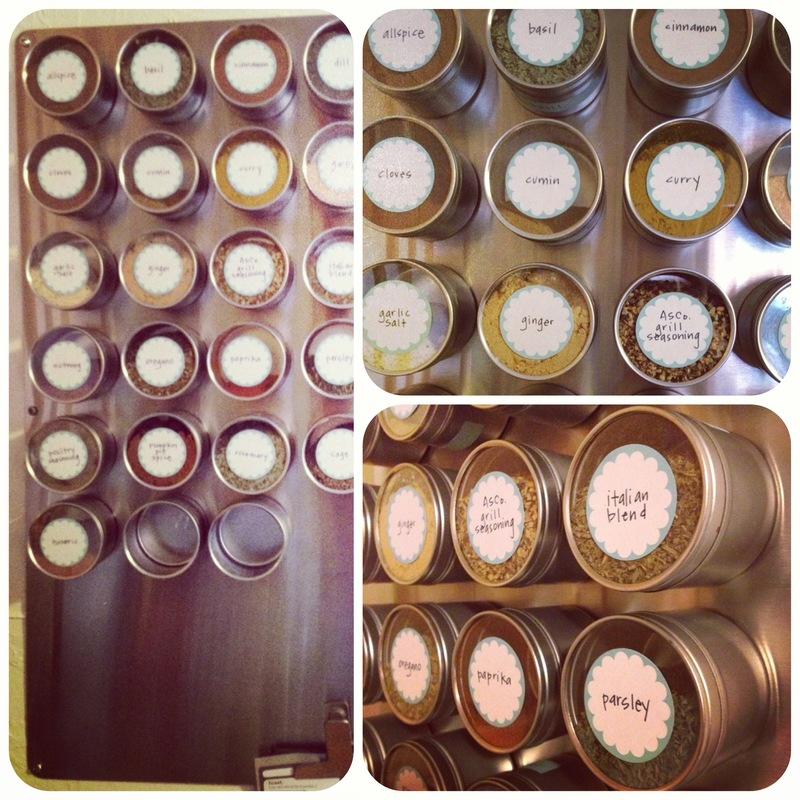 Friends of ours painted a wall in their kitchen with magnetic chalkboard paint & attached magnetic spice jars to it. Love! One of many sources online for a DIY vintage soda crate spice rack (swoon! ).